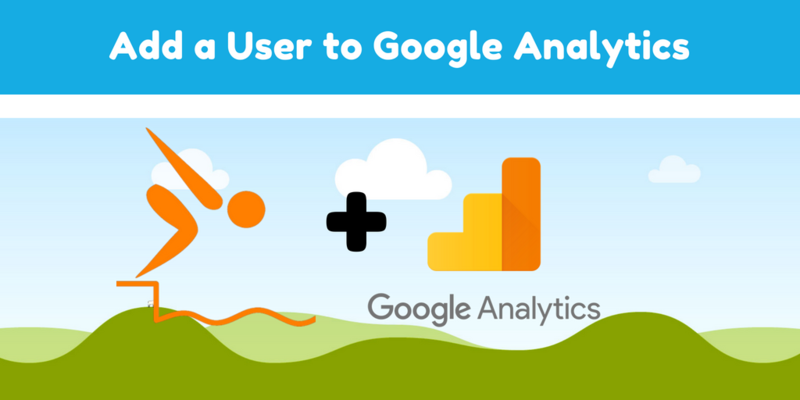 This brief guide will help you add a new user, like a consultant or developer, easily and safely to your Google Analytics account. I think it’s important to understand a request for analytics access does not give any access to your actual website. 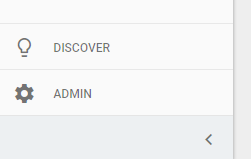 Your analytics account is completely separated from your site. Why would you want to give someone Google Analytics Access? If anyone is helping you with your website, it is perfectly normal, and desirable, for them to request access. Think of it this way: It often makes sense to have a second opinion on medical matters, but would you trust a doctor if they never asked for your medical history? Ok, maybe that’s a bit dramatic, but you get the idea. These instructions are intended to help business owners and site developers that I work with. My primary concerns are your accounts safety, security and my reputation as a professional. You would be surprised at how many business owners do not actually own, or sometimes even have access to, their own Google Analytics account. I can’t stress enough that business owners should be able to add and remove users on their accounts. Business owners should be assigned as a manager on their own accounts! The site developer may have to set up the account initially to install the proper tag on the site to start getting data from Google Analytics (GA). This is normal, but the site developer should always set up the site owner as an administrator. It is often appropriate to have someone else manage your analytics account. But they should NEVER be the sole owner of the account. If you are in this situation you are just asking for trouble! Just because you “own” the site, does not make you the GA account owner. Professional agents should always assign this role to the site owner. Relationships change, people move on and sometimes leave the actual business owner stranded without access. I have seen this many times, and it is not pretty! If you lose access to your site, it is not Google’s responsibility to get it back for you. You may be able to add a new analytics account back to the site, but you will lose any data you had from the old account. Step 1: Determine if your site is actually using Google Analytics. Skip this if you know already. I recommend using this page https://seositecheckup.com/tools/google-analytics-test. There are lots of tools on this page but just stick to the analytics checker. Just put in your site and it will let you know. If you have analytics on the site, go to step 2. If not, please contact me or your website maintainer to have it installed! Go to this page https://analytics.google.com . If you are already logged in as a Google user, you will be directed to a default account (usually the last one you were viewing). If you are not logged in, you should get a google login screen that says “Sign In to continue to Google Analytics”. If you cannot sign in, and see your account, it means this Google account does not have access. Often, people have multiple Google accounts. If you can’t find one with access please contact me or your site maintainer. Step 3: Go to the admin section for your account. Google Analytics is organized into levels. At the top level, there are accounts. Each account can have several properties (for example your site). Each property can have several views. There are well known best practices for setting up each level, but I will leave that to another post. If you have administrative rights, you can add users to any of these levels. We will look at adding a user to the account level to keep things simple. To access the account admin settings, click on the gear symbol on the bottom left of the page. In my example above you see “Demo Account” just under the blue create account button. This is a drop down in case you have multiple accounts. 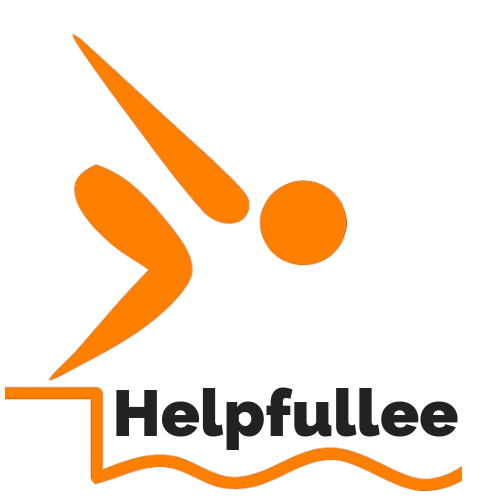 In this example, I will use the drop down to select the “helpfullee” account. Step 4: Open Manage Users Section. “You have access to this account, but you don’t have permission to manage this account’s users. 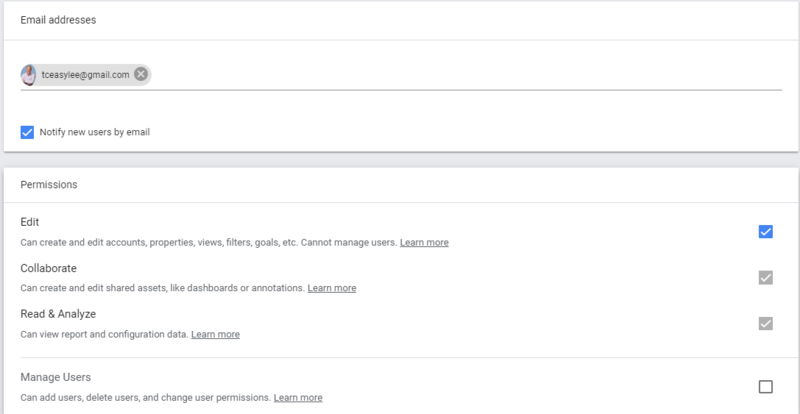 Without user management permissions, you cannot add/remove users or change other users’ permissions. If this is the case, you do not have admin rights to the account and need help from whoever has the account permissions. Again, business owners should ALWAYS have the ability to add or remove users for their own accounts! If you do not contact your administrator and get it! You will get a little drop-down, select “Add New Users”. A new screen will appear allowing you to add a user and set their permissions like the one below. Enter the new user email account (NOTE: the email must have google access!). I will review the permission options below. Most often, you will either grant the user “Edit” or “Read & Analyze permissions”. Edit – If your new user may be helping you optimize your setup, or help set goals, filter out spam, they will need Edit level access. Read & Analyze – If your new user just requests access to do reporting, like with Google Data Studio, you need only grant them Read & Analyze. You may change a user’s permissions at any time. There may be times when you do grant the “Manage Users” permission. I often will grant it for my own backup accounts just in case, or I will connect a trusted partner. Just remember, if someone has “Manage Users” they can remove other users, and that includes you! I have gone through this example at the account level, just to make it a bit simpler. There may also be cases when you only want to grant access at the property or view level.